Turkey’s president, undeterred by moral implications, continues to politicize New Zealand mass shooting ahead of looming local polls. Before embarking on a gruesome carnage at two mosques on Friday in New Zealand, Brenton Tarrant, a 28-year-old white supremacist, released a manifesto in the mold of his inspiring model Norwegian Anders Breivik, laying out the rationale and motives behind his shooting. Tarrant, a new representative of the alt-right and white nationalist ideology, desired to spark a civil war in the U.S. and to rekindle the debate over immigration and the “overlooked” issue of white genocide in the face of the invasion of ‘colorful hordes.’ His ruthlessness in the execution of his plan stunned the entire world and spun the New Zealand government into action to impose a ban on semi-autonomic weapons and military-style assault rifles. No less significant was the result of a realization of the need to have a proper debate on the global reach of white supremacist ideology and its digital vanguards. Somewhere in his 75-page manifesto, Tarrant pointed to Turkey’s president as an enemy figure to be dealt with. That mention, momentary though it was, became a favorite theme recurred by President Recep Tayyip Erdogan over and over again over the past several days. Tarrant talked about re-taking Istanbul, removing minarets of Hagia Sophia, currently a museum, and turning it to a church once it was. He also expressed his desire renaming the city to Constantinople, in reverence and reference to its Christian identity after Byzantine Emperor Constantine, who recognized Christianity as the empire’s official religion, built the city as an ideal Christian city in 323 A.D. The capital of the Eastern Roman Empire, after 11 centuries of its foundation, fell to the Ottoman Turks. With the manifesto and mention of Istanbul, Tarrant touched the nerve system of the Turkish president and the Turkish people. President Erdogan presented himself as the target of a heinous scheme and cultivated a sense of victimhood ahead of impending local polls. Undeterred by its moral implications, the president did not have any compunction over airing a blurred video of the shooting at rallies to thousands of people, with little regard to the presence of small children and women. By doing so, he blatantly disregarded a global consensus among world media outlets and the international community about not showing the video on internet platforms or mainstream media outlets to deny what the shooter exactly craved— unfettered global access with maximum impact for the advertisement of his inhumane act. This, not surprisingly, sparked a diplomatic spat with New Zealand where the government and public still reckon with the calamitous aftermath of the fatal shooting. While New Zealand has its own political and moral reckoning of the shooting and an alien extremist ideology that infiltrated into the peaceful, serene corner of the world, the way how the Turkish politician approached the matter ruffled feathers in this country of “Hobbits,” prompting it to dispatch its foreign minister to encounter Erdogan in Turkey. As if it was not enough, the president also incurred the wrath of Australia and New Zealand after imprudent remarks on Anzacs amid Gallipoli War commemorations in the western province of Canakkale where more than a century ago Australian and New Zealand soldiers, along with the imperial British troops, fought against the Ottoman Turks in an epic battle. Unlike other nations that fought against the decaying Ottoman Empire and the subsequent young Turkish Republic, Turks did not harbor any sense of grudge against Anzacs, and joint commemorations mostly served as a platform for cultural and social interaction of its own. “Any Australians and New Zealanders traveling to Turkey with anti-Muslim sentiments would be sent back in coffins “like their grandfathers” were in the Gallipoli campaign,” the Turkish president said. His off-script, unscrupulous remarks unnecessarily threw a century of friendly relationship between Turkey and the two countries into jeopardy. Australian Prime Minister Scott Morrison summoned the Turkish ambassador, demanding an explanation over the president’s statement. He warned against the risk of deterioration of ties. The Turkish presidential press advisor’s efforts to play down Erdogan’s ‘coffin’ remarks did little to soothe the jolted nerves of New Zealand government. It took a personal visit by New Zealand Foreign Minister Winston Peters to Turkey that softened Erdogan’s rhetoric. Appeared to be moved by the gesture of New Zealand Prime Minister Jacinda Ardern after Friday prayers, the Turkish leader praised Ardern for her exemplary stance. “I would like to thank the government, especially the prime minister, on behalf of myself, my country and my organisation for their determined stance against the event. 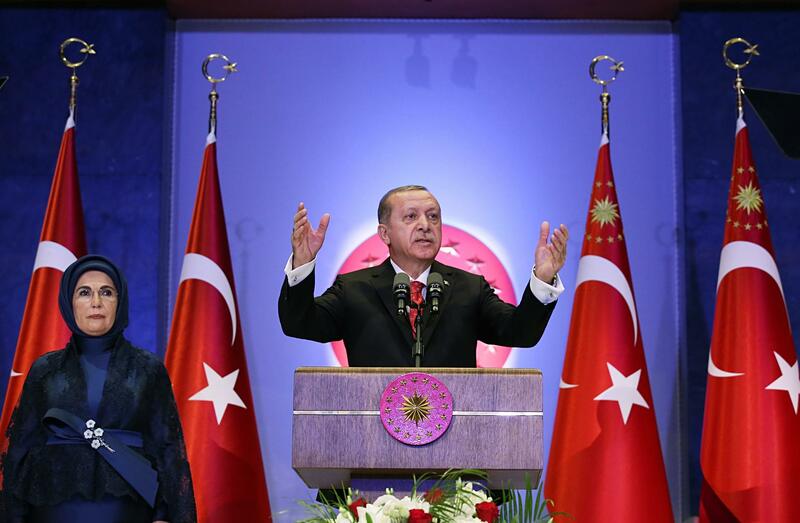 The reaction, and the empathy on display, should be an example to all world leaders,” Guardian quoted Erdogan as saying at the summit of Organization of Islamic Cooperation (OIC) in Istanbul on Friday. Erdogan’s detached attitude breaks with the conventional moral sensitivities about publishing footages of mass shootings and related violent scenes. Yet, his moral indifference obscures a far deeper problem that became his main trait. The president quickly capitalizes on any tragedy, however harrowing and despicable it may be, if there are certain potential political prospects at stake. He quickly personalized the matter and even challenged the shooter to try to do the same in Turkey. The Turkish people, Erdogan noted with confidence, would give him the appropriate response he would deserve. But he took the matter one step further. After airing the video and slamming Islamophobia and anti-Turkish sentiment as the main driving impulse behind the shooting, Erdogan insinuated that main opposition Republican People’s Party (CHP) Chairman Kemal Kilicdaroglu would suffer the same end in March 31 elections. The CHP leader’s earlier depiction of Islamic extremism as a threat for the Muslim world made him a target. “At this point you are with terrorists,” Erdogan fulminated in fury. The political opportunism pandering to the emotional needs of his most loyal constituency casts a politician who is increasingly out of touch with reality during times of such crises. That was on vivid display in the aftermath of the New Zealand shooting. Either by instinct or design, the shooter gave Erdogan a windfall to dwell upon ahead of polls, something that he would nurture to polish his image as the defender of Islamic world and Muslims living across the globe. From the first moment of the massacre to this day, the president blended his inflammatory rhetoric and rabble-rousing with elements of chauvinist nationalism and anti-Western sentiment to exploit the issue for political purposes in the domestic realm. Needless to say, such kind of saber-rattling is the last thing the world needs now. The bloody shooting has exposed the perils of tech giants’ shortcomings and the need to fight the contagious sweep of far-right, xenophobic ideologies on a global scale. In the face of such immediate challenges, prudence and common sense must guide the discourse of politicians around the world, not rabble-rousing and political opportunism.